There is so much to see along the Great Ocean Road and this tour allows us to explore some of the hidden gems that most visitors never see. Secret beaches, longer hikes, stunning mountain views, with an abundance of wildlife and some excellent Aussie tucker are just a few of the extra highlights you will be rewarded with if you spend a few days with us on this tour. ** Note: under 18 years of age traveler must be travel with legal guardian and must stay in private room. Koala Spotting in the wild Spot wild Koalas, Kookaburras and colourful Australian birdlife. Lunch Enjoy a picnic lunch in Apollo Bay. Tower Hill National Park Victoria’s first National Park is a 30 000 year old extinct volcano. Originally the land of the local Koroitgundidj people is now a wildlife wonderland full of Koalas, Emus, Kangaroos, Magpie Geese, Echidnas, Possums as well as waterbirds. Mount Rouse Take a walk to the very top of this extinct volcano, believed to be over 2 million years old and enjoy spectacular views of lava fields and surrounding landscape. On a clear day you can see the ocean to the south and Grampians to the north. Halls Gap Spend time in Halls Gap and get your lunch in numerous cafes or restaurants. Try a classic Aussie pie or a traditional gelati. Brambuk Aboriginal Cultural Centre Learn about the history and culture of Jardwadjali and Djab Wurring Aboriginal tribes. Surrounding gardens are a great place to relax and spot more wildlife. Chataqua Peak or the Pinnacle Explore the breathtaking beauty of massive sandstone outcrops and eucalyptus covered slopes of The Northern Grampians. This 2 hour long hike will take you through a densely vegetated gully and up to the base of iron-stained cliff. A short uphill scramble to the top completes the walk and offers breathtaking views of the Northern Grampians and the Wimmera plains. Sturdy hiking shoes with good grip and at least 2 litres of water are essential. Aussie BBQ Help to cook a true blue Aussie BBQ for tonight’s dinner in the Grampians National Park. Overnight stay in Grampians Spend the night in the heart of the Grampians National park. 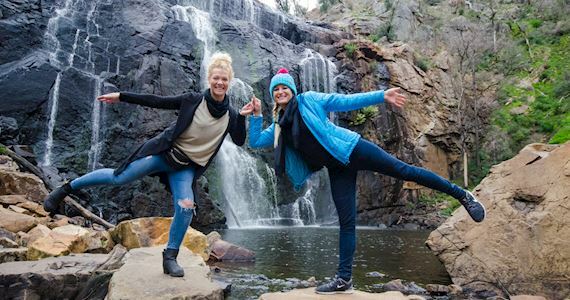 Tour the Grampians National Park Home to the Kangaroos, Wallabies, Koalas, Emus, Birds, Echidnas and many other Australian creatures as well as an abundant array of plant life. Truly a wildlife, waterfall, walking wonderland! McKenzie Falls or Silverband Falls A pleasant walk to see the beautiful McKenzie Falls or the Silverband Falls. Reed’s Lookout or Lake Bellfield Take a stroll along the lake’s shore and breathe the fresh mountain air. This ever popular walking and picnic spot is just a short drive from Hall’s Gap. ‘Jaw’s of Death’ or Aboriginal Cave Paintings Bunjil, the almighty Grampians creator, was the leading figure in spiritual life of local Aboriginal people. The only known rock art painting of Bunjil, is found on the way to Stawell.